Eugene, OR - tripadvisor® is a go-to source for vacation planning due to the millions of customer reviews that are available on everything from hotels to restaurants and attractions. Whether you&apos;re a leisure traveler looking for a place to take the entire family or a business traveler heading to that next meeting or convention, tripadvisor® is a trusted source for unbiased reviews. So, when a local hotel makes the Top 25 Hotels - United States list it&apos;s time to celebrate! 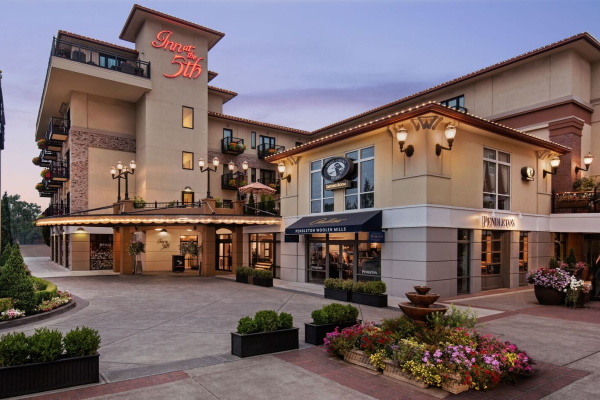 Opening in 2012, the Inn at the 5th is located in the historic 5th Street Public Market and continues to wow guests with art from Oregon artists, fireplaces in many rooms, on-site spa services, and walkable access to quality restaurants, shopping, wine-tasting and performing arts venues. Andy Vobora, Travel Lane County Vice President of Stakeholder Relations, added, "In 2012, the Inn at the 5th was the first downtown Eugene hotel property to be constructed in nearly three decades and it was an immediate success. This wasn&apos;t a surprise to our staff who regularly work with the Inn at the 5th team. We congratulate owner Brian Obie, general manager Kathryn Allen and the entire team on being recognized in the tripadvisor® Top 25 Hotels!"